Each month has a stone, but don’t let your birthday limit you. 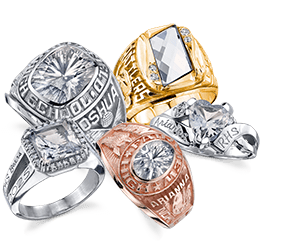 Use these legends to pick the stone that speaks to you. Garnets were the most popular gemstone in the later years of the Roman Empire. The gem always looks like it is emitting light, which led travelers to carry them to light up the night. Perfect for: Travelers, late-night studiers and maybe those afraid of the dark. Amethyst (Ultralite) is said to strengthen relationships and give its wearer courage. Ancient Greeks thought the gem would clear their heads and help with quick thinking. Perfect for: Those dreaming of far-off cities, Jeopardy enthusiasts and old souls. Aquamarine has a calming, soothing energy reminiscent of sea water and clear skies. Sailors brought aquamarine stones on voyages for calming purposes like getting a good night sleep. Perfect for: Those who toss and turn all night, sailors and yogis. White sapphires have long been said to bring wisdom and strength through clarity and energy. They reveal talent and potential when the wearer is faced with difficult choices or circumstances. Perfect for: The indecisive, those afraid of the challenges of adulting and probably weightlifters. The dark green of emerald hints at the renewal and revival of springtime. Legend says this was one of Cleopatra’s favorite stones. Perfect for: Those who are happy to see the end of winter, spring cleaners and Egyptian history buffs. The transparent yellow-green of alexandrite transforms in the sunlight, ranging from red to dark purple. This complex stone is thought to promote intuition, creativity and concentration. Perfect for: The academics, the artists and the easily distracted. Rubies have long been associated with good health and physical strength. A regal stone, the dark red of ruby is said to promote energy and safety. Perfect for: Future doctors, future royals and the kids you beg to put down the video games and go outside. 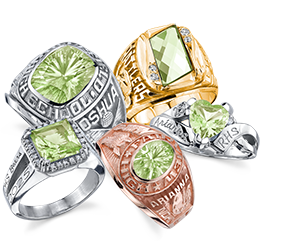 Peridot gems stay the same color in both natural and artificial light, which led ancient Egyptians to associate this gem with beauty. Because the green endures through darkness, peridot is believed to fight off nightmares and bring confidence. Perfect for: The nightmare-prone, the highly opinionated and all who need a pep in their step. Sapphires (Blue spinel) are thought to ease pain and reduce stress. In the 17th century, the gem was popular among those searching for truth, meaning and honesty. Perfect for: Perfectionists, the philosophers in your life and those with too many books in their backpacks. 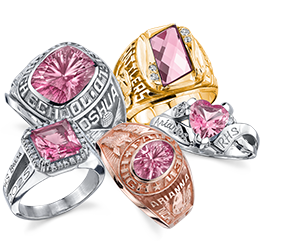 Pink sapphires are believed to bring wisdom and resilience into your life. These gems are said to assist in big life transitions as well as forgiveness, acceptance and letting go. Perfect for: Nervous grads, the highly compassionate and, honestly, Hufflepuffs. Golden sapphires inspire action — joyfully turning ideas and goals into reality. They are said to promote movement in exciting new directions. Perfect for: The adventurers, the dreamers and maybe those afraid of change. Blue zircon is associated with new potential leading to greater happiness. These gems are also believed to help you understand your feelings and turn your wishes into reality. Perfect for: Those looking for a magic genie, those in touch with their emotions and those who color-code their planners. 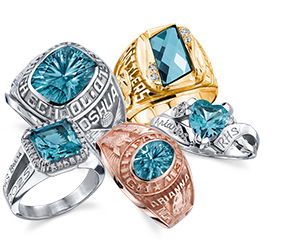 Now that you know what each stone means, it’s time to design your class ring! Herff Jones offers simulated birthstones and premium stones.